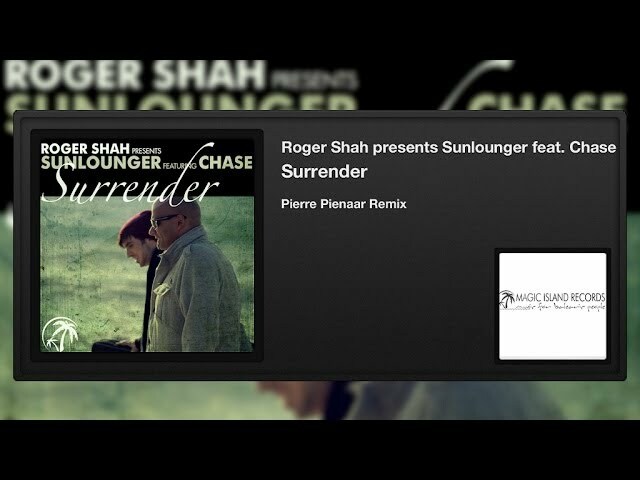 Last year, with his ‘Balearic Beauty’ album, Roger Shah shaped a summer all of his own. Its first single - the Alexandra Badoi-sung ‘I’ll Be Fine’ - captivated fans of old, won fans of new and gave Roger another huge club hit. Now, with a new summer fast approaching, May 19th sees ‘I’ll Be Fine’s primetime follow-up. ‘Surrender’ has proved a forum favourite, a hot request at Roger’s live shows and one of the foremost jewels in the fourth Sunlounger LP’s sound crown. Featuring the vocals of West Virginian-raised/LA-based singer/songwriter Chase, ‘Surrender’ arrives in single form with a complete remix spectrum. Sound-crafters including Walden, Pierre Pienaar, Brian Laruso, Raul Pablo Sanchez and Roger himself (under his Areeena alias) have taken ‘Surrender’ to spaces far and wide. With its folk-ish tones, lyrically and vocally Chase channels everything from indie to baroque pop into ‘Surrender’. In its Original Mix form, Roger takes all those well known Sunlounger instruments and elements - gently thrummed guitars, timpani drums, analogue synths and wistfully plucked string sections - to deliver the track’s reclined cool. On his Touching Your Soul rework, Brian Laruso adds shuffling and live-sounding cabasa and marimba percussion loops, giving the track beachfront ambiance. Roger’s Chillout Mix drops the drums out entirely, resting it entirely on its guitars, pianos and Chase’s acoustics for that sundown moment. On his mix, Raul Pablo Sanchez intensifies the LFO, echoes & dubs up the FX and uses longer held notes and housier rhythms to usher ‘Surrender’ into the night. Through remix treatments from Pierre Pienaar, Areeena, and Walden, ‘Surrender’ gets ready to leave the beach and take it club-side. Fuelling trance-inclined floors to scarcely safe limits, through his remix and instrumental treatments Namibia’s Pierre Pienaar springboards the track into peak-time. Areeena (whose ‘Between 2 Worlds’ debut shook more than its share of speaker-stacks last autumn) toughens the trance stance further with its synth-stridence and rolling bass. Last and by no means least, Australia’s Walden reimagines ‘Surrender’ as an immense progressive house workout. Replete with irresistibly cheerful synths, it’ll be keeping floors on their toes throughout summer.